Searching for E-Cigs and Vaping supplies in Edmonton? Our smoke shop carries a full line of electronic cigarettes, eHookahs, personal vaporizers, and e-juice flavors from leading brands and boutique suppliers. From batteries and chargers to liquids and chambers, we carry all of your favorite e-cigarette and electronic hookah supplies. New to vaping? Talk to our friendly staff to learn more about this popular alternative to smoking or check out our section on How E-Cigs Work. Many smokers are turning to carrying small canisters that simulate the sensation of smoking but release a vapor rather than smoke. These can be shaped like cigarettes, pens, a small hookah, cigars or even pipes. 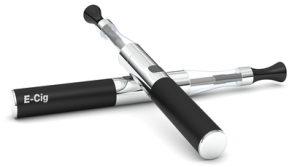 Rather than relying on tobacco and fire, electronic cigarettes use liquid and a heat coil to create a vapor or mist that is inhaled instead of smoke. The liquid can contain various amounts of nicotine (or no nicotine at all) along with appealing flavors like menthol, mint, chocolate, coffee, apple, cherry, raspberry, and caramel. Battery – A rechargeable lithium battery is used to heat the liquid. These can use a charger similar to your phone or a USB cord connected to your computer. Cartridge – The cartridge contains a liquid, known as e-juice, comprised of propylene glycol (or vegetable glycerin), flavoring, and/or nicotine. LED Light – There is usually a light at the end to indicate when the vaporizer is in use and to simulate a burning cigarette. Sensor/Processor – The sensor registers when you take a drag so the processor may activate the atomizer and LED light. Inhaler – The inhaler is the tip that serves as the mouthpiece connected to the cartridge.